Because of the transient nature of military service, Military Spouses often have a difficult time working on their careers. However, they are often excellent candidates for an unlimited scope of jobs. 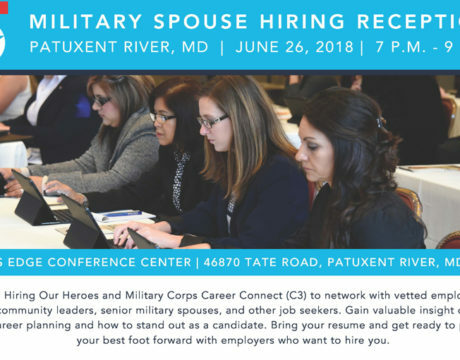 To help solve this problem, The Patuxent Partnership is planning a Military Spouse Hiring Reception from 7 to 9 pm June 26, 2018, at the River’s Edge Conference Center, NAS Patuxent River. 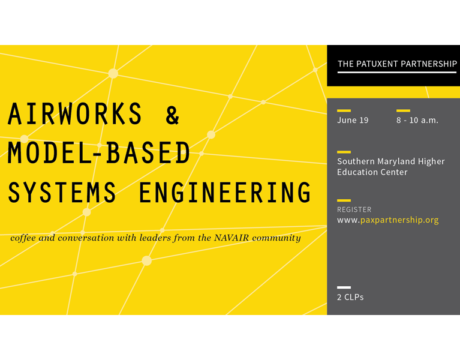 The Patuxent Partnership is hosting an educational event for participants to learn more about AIRWorks and Model-Based Systems Engineering. The event is planned for 8 to 10 am Tuesday, June 19, 2018, at the Southern Maryland Higher Education Center.